So this blog thus far has by and large been about drafting – since it doesn’t require cards and gets you more cards. Remember, though, the goal of this F2P run is to build a competitive standard list. Previously (before set six was released), I was planning on building Heraldbomb to take to the constructed queues. Numerous nerfs with the onset of set 6 has left me extremely hesitant to build this deck, so much so that it is no longer on the table. Which is kind of lucky, since I dislike playing the deck. But, set 6 was fairly kind to budget players – there are several Heroics that let you build a deck with very few legendaries at all. Most of them are zombies! So I’m going to take a look at these lists today. All are taken from the tournaments at solforgeladder.com. So here we have two Zombie lists, both Alloyin purely for Discordant Strike. Qui1 placed 3rd and Linyvine placed 4th (across two different tournaments). These ladder tournaments are fairly competitive, so this is quite an accomplishment and the lists are more than good enough to jump straight into Constructed Queue with. Qui1’s list seems to play a more controlling role, with Epidemic, Darkshaper Savant, and Sorrow Maiden. He also chose to play Immortal Echoes and Scythe of Chiron as his legendaries – Immortal Echoes for inevitability, and Scythe to push damage and shrink creatures (to work with both Maiden and Xrath’s Will). Linyvine’s list does not play Sorrow Maidens or Immortal Echoes, and is much less control-y as a result. Instead he seems to go for a more aggro-control oriented list, with Plunder Imps to disrupt and things like Zombie Titan to have big creatures to pump with Zombie Dreadknight without needing to set up with Abyssal Brute. Now, we could copy one of these two lists, and I would generally encourage most new players to do that. It gives you a feel for the deck and you can change cards around later. However, it’s also a good idea to think about your card choices as you start building the deck. So many Solforge players blindly copy lists without thinking about how their card choices will impact their play. I am not one of those players, so we’re going to make a Zombies deck from “scratch”, using these two lists as a foundation. I like all of these cards. Xrath and Zombie Dreadknight are the main core of the deck – Xrath gives all Zombies Regen (including the Dreadknight himself), and then Dreadknight pumps them. It’s a very strong combination, and swarms of large Zombies finish off opponents quite quickly. The next three are all supporting spells. Discordant Strike is an Alloyin and Allied Nekrium spell. As it is the only Alloyin card these decks played, it is impossible to miss on Allied Nekrium. Discordant Strike allows you to keep your Zombies alive even further by debuffing your opponent’s creatures, while acting as removal at the same time if you kill a weakened creature across the board. Additionally, it brings your opponent’s creatures in range of Xrath’s Will. Xrath’s Will is a situational spell that allows you to kill a small power creature on your opponent’s side of the board and gives you another play to play a Zombie in. Xrath’s Will shines when the format is in a place such as low power creatures are heavily played – such as Dream Tree, Thundersaur, Dysian Broodqueen, etc. But, cards like Discordant Strike and Scythe of Chiron allow you to bring creatures into range which you would normally be unable to kill, and it keeps your tempo intact by letting you play a Zombie afterwards. Tomb Pillager is the odd man out here. Qui1 played only 2, while Linyvine played 3. I don’t think there is a truly “correct” number of Tomb Pillagers. I would imagine Linyvine played 3 because it has a solid body (5/6 at rank 1), and thins your deck of underleved Nekrium cards so you have a greater chance to draw leveled cards. Qui1 played only 2 because it is consistent, so playing 3 of them in rank 1 does decrease your odds of drawing *other* cards, since Tomb Pillager is consistent. 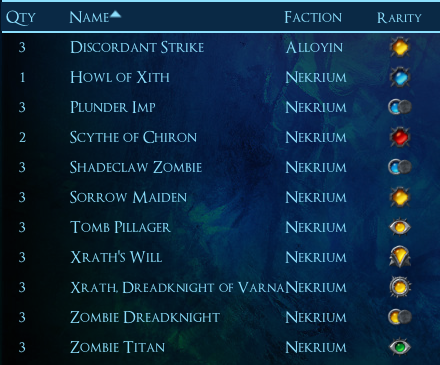 I would ten towards playing 3 myself, as deck thinning and consistency is a powerful tool in Solforge. As previously discussed, Qui1 is more control whereas Linyvine is more aggro. I don’t think either is necessarily wrong. Qui1’s list requires more set up time (due to playing Abyssal Brute), but is pretty resilient against other aggressive decks with its Sorrow Maidens and Darkshaper Savants. Linyvine’s just gets straight to business right away. I generally prefer the aggressive approach. There is an old saying in Magic that goes “There are no wrong questions, only wrong answers.” This means that in a format that is still fairly new, or you don’t know very well, you can’t go wrong playing threats (questions). But, you can go wrong if you play the wrong answers. Sorrow Maiden and Epidemic are good against multiple small threats – very good against them. But enter a format full of Shardplate Behemoths and nary a Thundersaur to be found, and they are much less effective. Whereas a 6/5 that attacks will always be a 6/5 that attacks. Plunder Imp – Required for this style of deck, since it provides aggression and disruption in one go. Zombie Titan – I like the adaption of Zombie Titan; it’s a 6/6 at rank 1 and has regen without needing a Xrath in play. Having it *need* to be in the side lane does hurt a little. Shadeclaw Zombie – While I don’t intend to play any other Darkforged, Shadeclaw Zombie is a decent zombie that has regeneration by default, and gets pumped if you play other Shadeclaw Zombies – especially potent at ranks 2 and 3. It does seem a little on the weak side though, so it may not make the final cut of the list. Howl of Xith – That last little bit of damage for when your Zombies sputter. That said, I like some of the elements from Qui1’s list as well. Primarily the Sorrow Maidens. 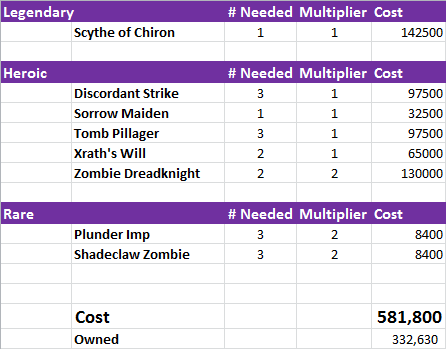 Sorrow Maiden is a great compliment to Scythe and Discordant Strike, even if I don’t have the Epidemics or Darkshaper Savants from Qui1’s list. That way I can still have a couple elements of control and removal in my primarily aggressive deck. Okay, so we’re about 250k short. Well that just means I can’t play the deck immediately. I’ll do some more drafts and try to play Nekrium to give me a shot at drafting the Zombie Dreadknights (the most expensive card in my crafting list). But that’s the list I’m aiming for, and it should only take me a week or two to get there, I am pretty sure.